^^ Also, for reference here are some low stimulus color saturation sweeps of the 2016 models with external 3DLUT by @ConnecTEDDD . Should be interesting to see if the internal 3DLUT on the 2018's performs any better. Does the new calman/lg 3dlut workflow support madvr as a pattern generator? any idea? It supports any pattern generator that supports RGB triplets. Can someone give manual 21-point calibration settings later? I dont have calibration equipment. I dont think anyone have in my country equipment to calibrate this hdr tv. LG needs to do calibration settings output to memory stick. Then other people can do calibration from that. You cant use the settings from other people. Every panel is different and need his own special adjustments. If you don't know someone who has the equipment then you better use some of the presets because these sets are pretty solid OOTB. 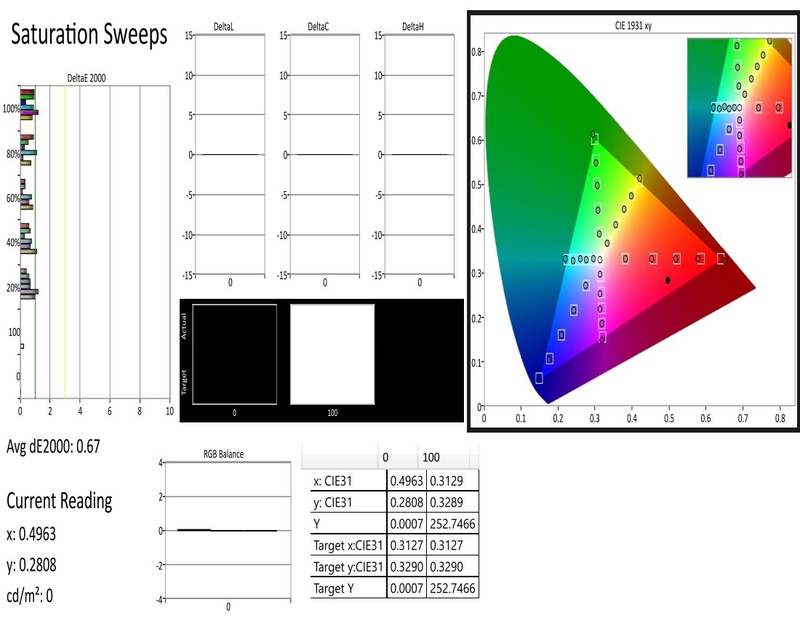 @jrref the results of your sweep chart are from a 3D LUT? Or did you only run 26 points Grayscale? No. Once you autocal a specific picture mode, the regular user controls for grayscale and CMS in the user menus are grayed out. AND once you exit and then re-enter autocal for a specific PM, the old results are erased and everything starts all over. That said, you can't work off of a previous calibration. The only thing you can do is once autocal is finished, you can use the manual DDC controls to touch up the results then store them. What i would like to see is once autocal is finished, if you go back into autocal, i would like to be able to re-calibrate from the last known good calibration in an effort to optimize it vs starting all over from scratch. That is for the grayscale. fafrd and mrtickleuk like this. So this was my first run just to get familiar with the workflows so i did a 26pt grayscale the a 101 pt Lightening LUT. You know when i look at this result again, it looks pretty good. I'm sure when you dive into the details it's not going to match the reference monitor but for a consumer set the deltaE is very good and the results with content look great to me. Also the set only had 24hrs of run time when i did this test calibration and is a retail set from Value Electronics and looking at the precal results, i can see it looked like it was off the production line and not "touched up" as some of the sets from LG to the reviewers may have been. There is nothing wrong with that, but i just wanted to point out that this scan should be pretty typical of what you will see. fafrd and BlackJoker like this. John, you might try doing it without the DDC reset just to see what happens. But CalMAN may zero out the 3D LUT as it does when doing a 3D Cube calibration on the Lumagen Radiance series (the only LUT boxes I have experience with). From what i can tell, it just overwrites the existing settings. It might be more beneficial to everyone here to measure more color points than the canned defaults. 5 or 10% increment saturation sweeps would be better @ multiple stimuli levels along with as many color points as possible with the color checker. I will post what autocal accomplished here when I retest to see if it is working for me now either tonight or tomorrow night but below are examples of what I'm suggesting from my A1E tests the past few days. Wizziwig, gadgtfreek and L30Z3N like this. Thanks jrref that's sounds really great I mean we know that good looking charts is only one side of the medal but it looks pretty solid especially when you only had 24 hrs on this panel. I hope I get my C8 in the next few days so I can share my results also. fafrd, dnoonie and jrref like this. Great i agree. Since you ran the large LUT on the C8, your testing should be the most accurate. @Light Illusion 's Steve has posted some really interesting findings relating to the behaviour of OLED TVs depending on what has been displayed previously changing the behaviour of the panel/electronics; they're coming up with some strategies to mitigate these effects during profiling (using stabilisation patches before the measured patch) but this begs the question, even once calibrated what level of accuracy can be expected from a WRGB OLED display? 2) Even if you can account for this during profiling (to give you a "flat" profile with the drift / instability taken out) you will still find the image drifting based on the current / previous scene / frames / etc. Does anyone have any data for what this kind of drift / instability actually looks like in real content? I'm really interested in a 2018 OLED to replace my ageing lounge LCD once I take my projector to a dedicated room - but I do wish that LG would open up the 3DLUT functionality to more than just Calman. I have been passing my recommendations over to Steve regarding this and I’m currently testing the current beta with the new feature. As I’ve stated many times before, LG OLEDs are thermally unstable. Patch insertion is just one of the necessary tools needed to properly calibrate these displays.... for consumer, not pro use. I’m in the middle of gathering more data points to help improve the LS engine. I’ve also reached out to Tyler regarding my finding so far with the C8 I have and CalMan. I want to improve Autocal too as I cannot wait for the day manual calibration is a thing of the past. As of now, that is still a long ways off.... in th consumer realm with WRGB LG based panels that is. Correct. Neither AutoCal nor LS are currently optimized for this just yet.... at least in the consumer realm. Which is a LGE/LGD issue. The drift and instability can managed but not 100% eliminated. The TV will appear more red when it is initially turned on compared to after being on for about an hour and can shift based on room temperature. Easily visiable in a controlled experiment with identical displays. So LG needs to build-in compensation for panel temperature. Do we believe your results indicate the same issue (shift over the first hour is also based on temperature of the panel increasing with use)? Do the Sony WOLEDs show the same temperature-shift effect? So LG needs to build-in compensation for panel temperature. Do we believe your results indicate the same issue (shift over the first hour is also based on temperature of the panel increasing with use)? Yes. That is why it has always been a recommendation to allow the TV to “warm up” for at least an hour before the calibration. So are there two issues at play here by my understanding - a "drift" which happens at least over the first hour, and an instability which happens over a much shorter timeframe and is impacted by things shown a very short time prior (perhaps even the same frame)? Are the patch insertions aimed at somehow keeping the temperature down by lowering the average panel brightness over the period, or because of some transient behaviour (micro retention etc)? It seems really important to fully understand these things, I applaud all involved here. Not only is it important to get repeatable profiles, they have to reflect real life usage too otherwise the end result won't be very accurate in use (though it may be accurate when re-measured using the same methodology). Really the profile for the display needs to be centred around "real life" usage. There's a good chance it seems to me that black frame insertion might be further from "real life" than something else. I know what you mean - experienced this 'drift' over my first few attempts at calibrating my 65C6P and discovered the importance of running both TV and colorimeter for at least an hour before beginning calbration session. Didn't have enough experience to know whether the source of the drift was theTV or the i1DisplayPro (or both), but your feedback makes it clear. Also makes it clear that if you are watching any content you really care about (as far as color & greyscale accuracy), you should play OTA TV (or whatever) for an hour on your WOLED before beginning movie night. Have you ever measured dE errors on a newly-turned-on WOLED following temperature-stable (after ~1 hour) calibration? It would be very interesting to see a graph of those dE errors over time to see how significant they are and how quickly they reduce as the panel heats up. Lastly, from your interactions with LG, do you have any idea whether they are aware of this issue? If they have the technology to deposit millions of tiny self illuminating pixels with phenomenal accuracy onto a piece of glass then you can bet your bottom dollar they have an extremely good handle on the actual behaviour of these panels in use. LG will fully understand how they warm up, cool down, age, burn, etc. They'll be working to improve all those things all the time. But of course they're not going to be shouting from the rooftops about the limitations of their technologies, it serves them no purpose. When you say "LG OLEDs" do you mean LG Display as in the actual panel maker meaning all brands have this issue(Sony,etc.) or just LG branded models? On first principles, you are probably correct (at least at the engineering level). On the other hand, from a marketig perspective, LGs priorities have always been a mystery. Look how long it took them to finally make edge-enhancement a user option that could be disabled. Or to introduce BFI. Heck, this whole discussion makes me want to redo my 3%/4% greyscale pics at both powerup and after an hours use to see if there is any visible difference. "Another common use to temperature sensing is to measure temperature at multiple points around the LCD/OLED screen for more accurate color correction. In this case, the TMP468 and TMP464 offer eight-channel and four-channel temperature measurement in a small, 3 mm x 3 mm QFN package." Hi. As an author of an open source test/calibration video mp4 file set (see the thread) I would like to steal a little bit of attention of audience here. I already have test patterns for 2016 and 2017 LG OLEDs and would like to keep it updated if there is a difference in the calibration procedures for 2018 OLEDs. Is there anything changed for the 'manual' calibration flow, i.e. are codes in the HDR10 grayscale list same as 2017 or yet again different ones? Are there any other patterns that could be needed specifically for 2018 OLEDs? Also I would like to support automatic or semi-automatic flows if there are any possibility (like a specially prepared flow of patches that the software will detect by timing / or some kind of time-code encoded in the video). Leaving a software with a sensor running for few / tenths of minutes is a lot better than repeatedly pushing buttons during an hour or so. Please let me know what can I include in the set. 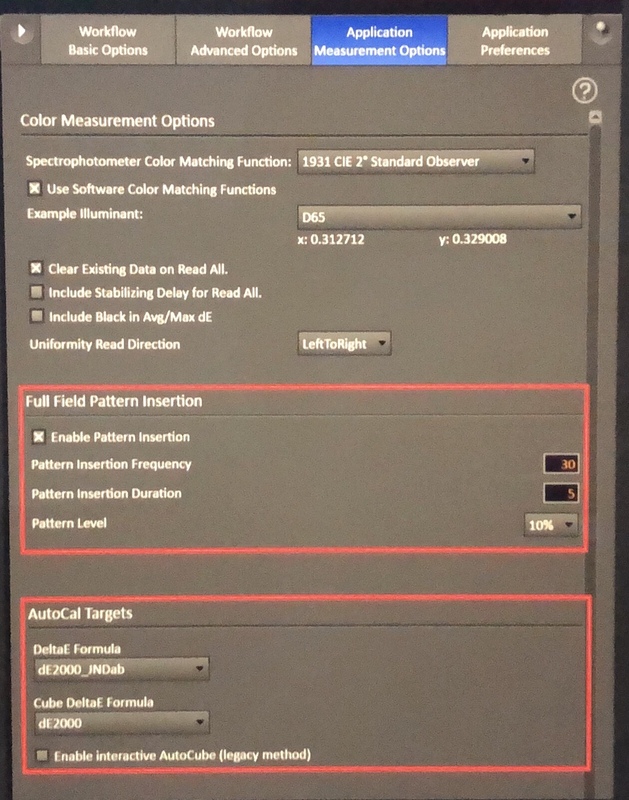 Today I installed the latest CalMAN 2018 beta 2 and I saw the new recommended settings for Autocal and pattern Inseration see above. 2) Why we have to set autocal formula to de2000_JNDab? Added new dE2000_JNDab formula that emphasizes luminance error, particularly at the low end. This what a first attempt at making a more luminance sensitive formula, it's literally the dE2000 number + the JND number. JND is strictly luminance with no chromaticity weighting. dE2000 typically takes L*a*b* where L* is the luminance weighting. Since both L* and JND are attempting to quantify the slightest visible difference as a unit of 1, I've substituted JND in for L* in the equation. Low dE numbers are very similiar for this formula, as the numbers tend to converge as you approach zero. It does place far more emphasis on luminance especially at the low end resulting in tighter calibrations. de2000 JNDab is the one recommended by Joel as the best speed/result compromised. The combined one [dE_CalibrationMax] could be marginally more accurate but the performance hit is huge.